Hitting the road with your best friend just got easier on your dog and your car. 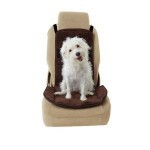 This protector guards your upholstery against hair, scratches and dirt while providing your pup with the supreme comfort of memory-foam cushioning and Microdry softness. Velcro straps make it easy to attach to most car seats and the fold-n-tote design makes it easy to move between vehicles. If a trip to the country gets muddy, simply throw it into the washer and dryer to clean up for your next journey. You and your best friend can travel in style and comfort with this airline-approved carrier that features memory foam right where you and your dog need it most. 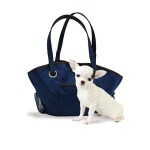 Inside, your dog enjoys the cushioning of a removable, machine washable memory foam pad while you benefit from memory foam padding on the handles and shoulder strap. There are also smart features like a peek-a-boo flap for easy access to your pal, a travel documents pocket, and roll-up blinds to customize visibility. Sized to fit beneath airline, bus and train seats.